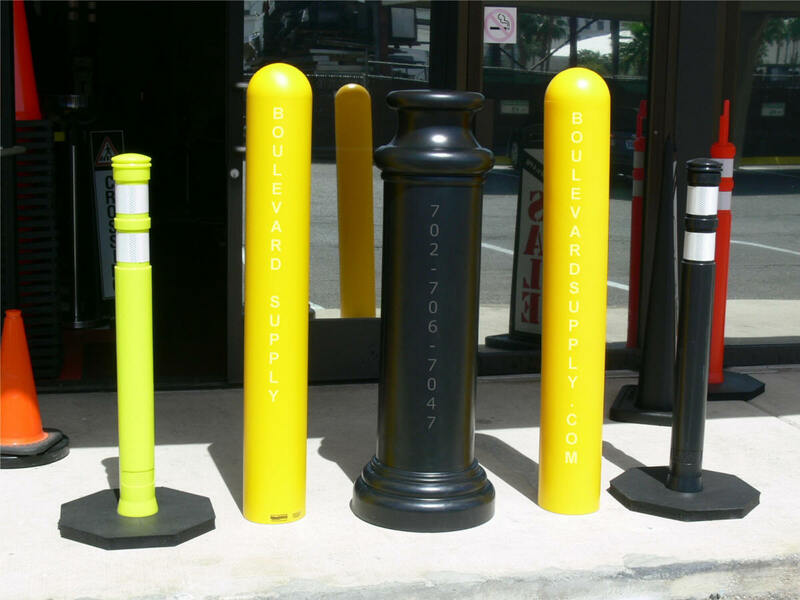 Boulevard Supply is your local Las Vegas dealer for Ideal Shield® lighted and plastic bollard covers. Eliminate your annual painting ritual and enhance the appearance of your storefront, restaurant, hotel or casino with easy to install bollard covers. Ideal Shield® bollard covers are Made in the USA! We all know painted bollards rust or the paint chips off and they require maintenance. Cement bollards are subject to chipping and cracking. The solution is plastic covers for your current bollards. STANDARD BOLLARD COVERS (1/8″ thick) – Fits bollard posts that are 4″ to 6″ and up to 60″ tall. These plastic bollard covers come with a 10 year warranty against color fading. Imagine not having to paint your bollards every year. Ideal Shield® standard bollards are 1/8″ thick (HDPE) polyethylene thermoplastic. 1/4″ BOLLARD COVERS (1/4″ thick) – Fits bollard posts from 3″ to 10″ and up to 60″ tall. These plastic bollard covers come with a 10 year warranty against color fading. Imagine not having to paint your bollards every year. The thicker shell allows for your company logo to be molded in to the plastic or we can apply a graphic version of your logo. DECORATIVE BOLLARD COVERS – Transform your old boring and chipped up steel bollards with our aesthetically pleasing architectural bollards. Classic, elegant and modern designs are available. Decorative bollard covers are a smart choice as compared to the expense of replacing your current bollards. LIGHTED BOLLARDS – Ideal Shield® also offers hard-wired and UV rechargeable lighted bollard covers. The UV rechargeable bollards are a great choice because they require indirect natural light (UV) as compared to solar bollards that require direct sunlight to recharge. Bollards are more common than you think and you may not realize it until your spouse rips the mirror off your car on one. Bollards line the front entrances of many retail and convenience stores, bollards protect fuel storage tanks and drive thru ATM’s. Bollards protect sidewalks and garage door corners. They also allow pedestrian traffic to pass through certain areas while preventing vehicle traffic.